Growing up in church, I heard the term "quiet time" a lot. The words described the time I spent reading my Bible and praying, and was often positioned in youth sermons (and a few "Big Church" sermons) as what stood between me and a healthy relationship with God. No quiet time, no healthy relationship. I was often regimented about my time spent "in the Word." I checked it off, first thing in the morning, like a workout, or a vitamin. I read through the Bible in a year. I made it all the way through my PB&J journal (prayer, Bible reading and journaling). It was only much later that my "quiet times" got less quiet. I went from saying (and thinking): "the Bible clearly says" to realizing that not everything is clear cut. In times of depression, exhaustion or suffering, I found myself reading just one passage at a time, like a track on repeat. 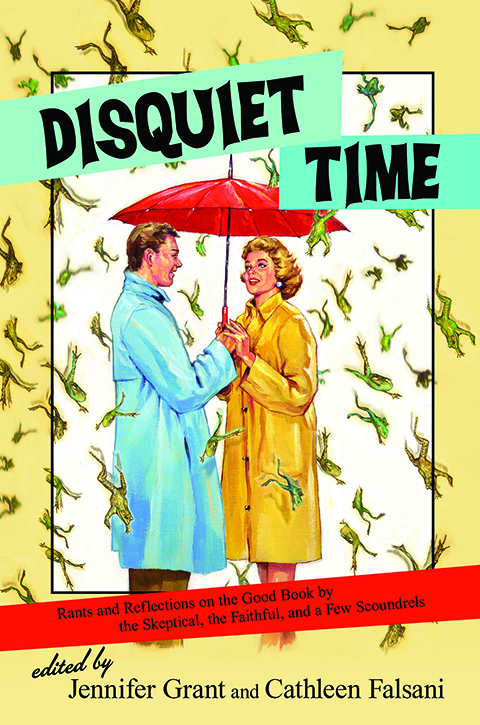 When I heard about Disquiet Time, and the premise behind it (the subtitle is: Rants and Reflections on the Good Book by the Skeptical, the Faithful, and a Few Scoundrels), I hoped that it might be my sort of book. I hoped that it might avoid easy answers, and that there would be things in it that would make me think, even things that would make me uncomfortable. I resonated with many of the essays in this book, and found myself nodding along with descriptions of worry surrounding the impending Rapture, or concern over the commandments for women to remain silent in church. I learned Hebrew and Greek words along the way, allowing them to cast some light on stories and verses that had seemed odd (or that I hadn't thought about much at all). Some of the essays dealt with familiar stories or difficult passages, others reminded me of places long forgotten, passed through quickly while I read the Bible through in a year. All of the pieces made me think, asking me to come a little deeper, or see things from another perspective. There are a host of voices here. They may not have everything in common, but they do share one thing: they all take scripture seriously. Many have moved from literal or anxious relationships with the Bible, but there is a wonderful lack of cynicism in these words. This collection does not seem to have much to prove. Each essay seemed fit to sit with for a time, lending itself to some disquiet of the soul, and a question or two. If anything, this book felt to me like a collection of conversation starters for the reader and God, a starting point for deeper relationship and engagement with the Bible. Some of the voices are new to me, others are familiar, much-loved, or well known. If you venture inside the pages, you may find yourself hearing scatalogical stories from Karen Swallow Prior, metaphors of wombs and birth from Rachel Marie Stone, and ruminations on 1 Corinthians 13 from Brian McLaren. I found some new friends among these pages (always one of the joys of a good essay collection), and enjoyed the company of those whose voices I already know and love. This is a book that I will place next to my bed, near my Bible. I want to use it to remind me that it is okay to question, to wonder, to disagree, and to dig more deeply. I want this book to remind me to seek out context and original language. But most of all, I want this cover and its provocative title to remind me that God doesn't ask for quiet disciples, but for people willing to enter into a conversation with the Divine. I will be returning to this collection often, lest I forget. You can find out more about Disquiet Time here. I am grateful to Faith Words for a review copy of this book.